Doubleday Books has launched a contest on their Facebook Fanpage for the opportunity to win two books about the hidden designs of our world. The details are simple: Become a Fan of the Doubleday Books fanpage by Clicking LIKE and Enter the Sweepstakes on the landing page. Only persons residing in United States who are at least 13 years of age can enter. Sweepstakes Ends on February 15, 2012 @ 12:00 pm (EST). 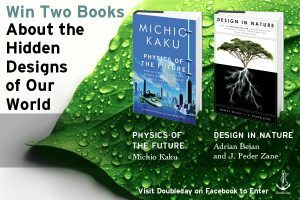 Five lucky winners will win two books on the cutting edge of physical & natural science, Physics of the Future, by Michio Kaku, and Design in Nature, by Adrian Bejan.